Hello everyone! I have been a very bad blogger. Please forgive me. I hope that you all had a very blessed Thanksgiving and were able to enjoy some quality time with you family. Today, I'm combining two posts in one. I'm going to share my latest creation for Classy Cards N Such which is also my sample for this week's challenge at The Perfect Sentiment. The Twist: you must CASE one of our designs and you must state in your blog post whose card you cased and what you took from it. Our sponsor for this week is ME! I signed a contract with Tracey Malnofski from The Stamping Boutique to sell some of her digital images. I've started out small with a selection of Christmas/Winter images. You will find them under the tab above labeled "Digital Emporium". One lucky random winner will receive three images of their choice. Since our challenge this week was "anything goes" and I'm in desperate need of getting holiday cards done I decided to make a Christmas card with some of the fabulous products from Classy Cards N Such. I love the Waiting for Santa Collection from Webster's Pages. I don't think I could ever get tired of using it. The text patterned paper with the red background matches perfectly with SU's Cherry Cobbler cardstock. The opposite side of the paper has some vintage holiday images which you can see on my two rectangle layers. I used the Lacey Ovals from Spellbinders to cut out a larger and small oval. I stamped the Curvy Cross from Verve in Cherry Cobbler ink and then stamped "Jesus" over it with Tuxedo Black Memento ink. Off to the right side I stamped "the true gift of Christmas" on top of the patterned paper where there was a bit of white space. These stamps are from a Verve set called Richly Blessed. My favorite part of the card is the Candy Cane Silhouette from Webster's Pages. I added a bit of red baby bling from Want 2 Scrap as the finishing touch. You can find the Webster's Pages paper and silhouettes, along with the Spellbinders and Want 2 Scrap bling at Classy Cards N Such. Go check out the great selection of products that Beverly has in store and take 10% off on me using my discount code: JENNIPHER-10. This is a wonderful Christmas card, Jenn! I love the colors (Cherry Cobbler is my new fave color btw!) but I didn't know how closely it matches those wonderful papers. 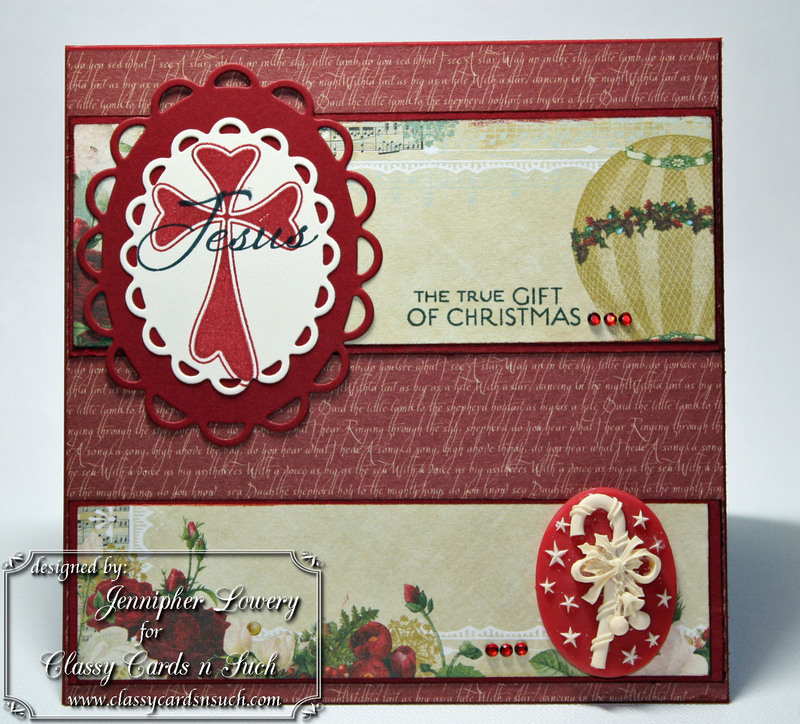 Everything works together so well, and I just love the candy cane embellishment. Great card and love the details with that yummy paper. Love the cross image and that candy cane, yummy stuff here. This is so beautiful, Jennipher! I hope you had a wonderful Thanksgiving and have time to enjoy the season! I too love the candy cane. The vintage paper is beautiful. Cherry Cobbler is one of my favorite colors right now! 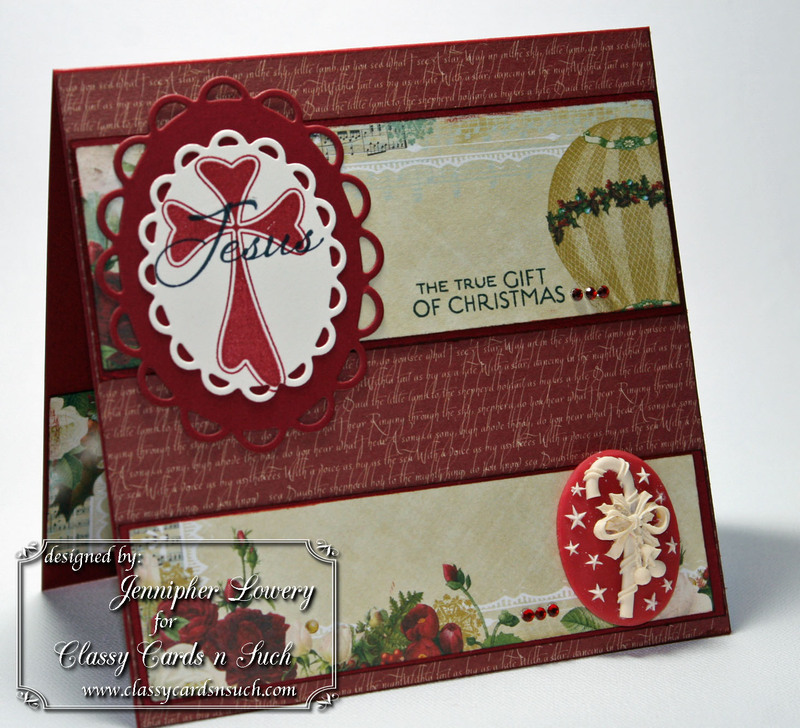 I have the embossing powder from stampin up & have been using it like crazy. Especially nice on chipboard. I trying to pick one card to "case"-but it's hard to pick one! They're all great. Beautiful card! I love the papers and that fun candy cane!